If you are a fisherman visiting San Diego during the winter months and want to bring home some amazing tasting rockfish, then the Fisherman III's Deep Water Mexico Rockfish Trip is for you. 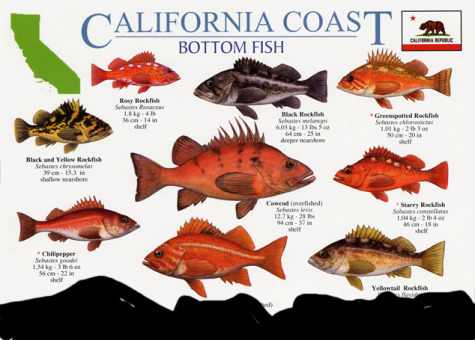 Winter rockfish season is currently closed in California waters until February 28th (For the most accurate and updated regulations visit Current California Fishing Regulations). However, there are still plenty of rockfish to be caught just south of the border. Bring you passport and hop on the Fisherman III for one heck of a bottom fishing trip. Above is a laminate rockfish poster that can be found here. On the Fisherman III you get a preview of a a long range experience on a 1/2 day or 3/4 day trip. This trip left at 8 am and was back at the dock at 3pm ( a little longer than 1/2 day trips in Florida which is definitely a plus.) Captain JD MgcGriff and his crew of three (Katie Ronning, Doren Garcia, and Edgar Cabral) were great to fish with. They were not only knowledgeable but full of good humor throughout the trip. The back of the Fisherman III is bustling between trips. Anglers are talking fishing, mate Doren Garcia replenishes baits for the next drift, while mate Edgar Cabral gives some pointers to anglers willing to learn new tricks. The first thing you do when you walk aboard the boat is get your number as well and figure out whether you want to join the boats jack pot. 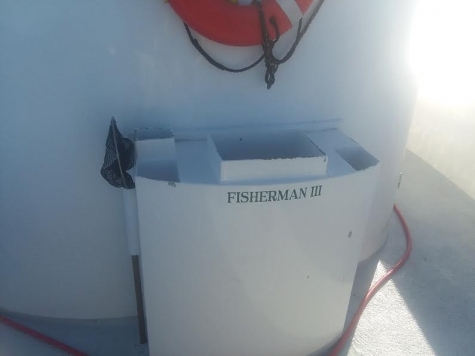 The number on the Fisherman III is pre-assigned unlike on other boats I have been on, and for good reason. You will be catching fish, and you will have your own numbered sack for the fish you will catch. 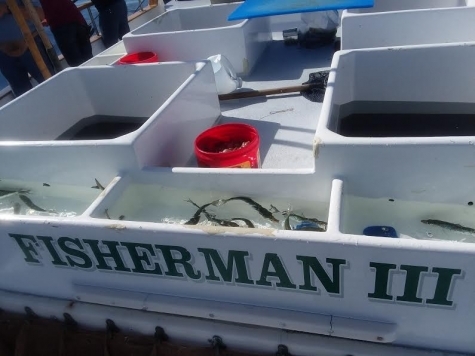 The jackpot is an age old tradition that anglers will experience on head boats around the country, I have personally seen this system implemented on head boats in New York, Florida, and now California. The way the jackpot works is anglers pay a small fee at the beginning of the trip which goes into a pile. At the end of the trip, the angler who entered the jackpot and who has the biggest fish wins the whole pile. This is a great way to get some friendly competition going between the anglers on the boat, and to keep them on their A Game. Above is a picture of the Galley on the Fisherman III. You can order anything from a breakfast burrito , to a bacon Cheeseburger while on board. The galley is also stocked with an assortment of drinks including coffee, soft drinks, water, and beer. Mate and Chef Katie Ronning cooks up a mean cheesburger for hungry anglers while Cpt. JD MgcGriff lines up the boat on good bottom. This isn't your average tourist trip. With 16 anglers aboard the boat, these were seasoned local fishermen who have been around the San Diego Long Range Scene for a while. There were a few visitors on the boat like me, however they had traveled specifically for this trip and knew what they were doing. The hour and a half trip to the fishing grounds is a blast because there are plenty of people to talk fishing with. Below is a video posted on Youtube by "H&M Landing " That gives you a tour of the Fisherman III. The boat is extremely well equipped for trips like this. It has four live wells in the stern with mini live wells for easy hand access to the freshest baits. The bow has its own live well for when baits need to pitched to fish that are being pursued. Since this was a bottom fishing trip, no baits needed to be pitched from the bow but if you have ever been tuna fishing before, you know how handy this can be. Coming from South Florida, I'm used to putting in a good hour or two to Sabiki bait before we head out for a good days fishing. Here in San Diego you pull up to the bait barge and simply load up with scoops upon scoops of sardines (there are often a few tinker mackerel mixed in). One angler aboard the boat told me that anglers actually are not allowed to cast net their own bait here (however I have not confirmed this). If you have never fished out of Southern California SOCAL than you have probably never seen anything like this. I posted a few videos for our instagram followers to see the amazing baitfish setup that SOCAL anglers are blessed with, so I don't have my own video for this, but this video posted on Youtube by " Port Of San Diego" on Youtube shows you how awesome this local resource is. Most of the rockfish that were caught were caught using live sardines. However, many anglers also used cut squid, as well as added soft plastics to their rigs. Most anglers used 30-50 Lb braided fishing line and small high speed conventional reels to put a hurting on the rockfish. As far as your rod goes, you are going to want something that is stiff enough to drop an 8-16 oz weight down, yet has enough action for you to really feel the bite. Most leaders were made of 30-40 Lb fluorocarbon line with circle hooks no bigger than a 5/0. Many anglers also used live bait J-hooks and had good success with those. The crew informed me that you are not allowed to use more than 3 hooks on a rig while fishing for rockfish in Mexican waters. Since fishing regulations are always changing we would recommend looking them up or speaking to the crew of the boat. When we find a guide that looks like it is up to date, we will add it here. The best rig for this type of fishing is chicken rig or dropper rig, because this will allow you to hook multiple fish at once. If you are getting into bottom fishing, you may want to check out our resource on making bottom fishing rigs. The rig below posted on Youtube by " MiamiFishN" is most similar to the rig used aboard the Fisherman III by most anglers, however most anglers are using between an 8 oz and 16oz lead sinker for this trip since the water is deep and there can be current. The fishing is very similar to other types of bottom fishing. Simply drop your bait to the bottom and reel your line up a few fee from the bottom so you don't snag. Most of the time the bite is instantaneous. What REALLY cool about this type of fishing is that you often bring up several species at once. I had to rely on the Cpt. JD and the mates to identify each type of rockfish. They not only have their official names but each rockfish has its own name known to locals. Still not there yet, but hope to be soon. Most anglers caught close to their limits on rockfish. We hope that you enjoyed this article on the Bullbuster Community. Our mission is to help millions of anglers spend more time fishing and that starts with YOU! Get a hold of our brand direct fishing line to join a movement!